Zippy the Monkey or Chimp was so weird. I never had one but all my mates did and i have to say they gave me the creeps! I guess it was due to the fact they were so life like and about the same size as the average toddler. They had a red & white hat. Shirt with the name “ZIP” printed on front. Red Corduroy pants with suspenders. Black plush body with rubber face, hands and shoes. “Rushton Co” printed on bottom of shoe. No Banana. I seem to remember his arm squeeked too. Zippy was re-introduced to the market in the 1960s & 70s again, by the Rushton Co. He looks the same as the original 1950s version – except the 50s Zippy had Howdy Doody on his hat. Another popular 1950s – 1960s monkey was Mr. Bim. He came in 2 sizes. Though the difference is he holds a banana. 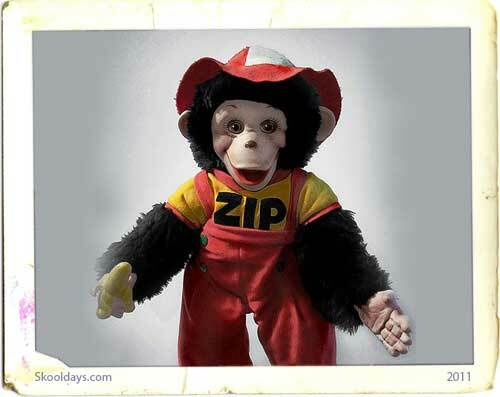 Zip the Monkey stuffed animal was derived from the famous real tv chimp of the 1950s. He made many appearances including the Howdy Doody Show. Zippy’s girlfriend was Tippy – she looks just like him except her fur is white and she wore a dress. Ebay is full of imitation zippy’s for a small price but the originals are now fetching anything from £100 up! I have this monkey and it is in great shape considering his age. If anybody is interested in pics and possibly purchasing him let me know. I would love to see pic of your Zip monkey.Im looking to buy him and his girlfriend with the blue dress. How much would you want for the monkey? I am looking to replace a toy my grandmother gave me as a small boy that was exactly like this one. Please contact me with more details. I have a monkey whom looks like the one in the picture above except the outfit is different, my grandmother had it my whole childhood then it was given to my oldest son in 2009. I have Zippy! My great uncle got him for me when I was 3 or 4. I am 57 now. My Zippy is priceless! I wouldn’t sell him for any amount.